We buy, sell and part exchange used welding equipment. If you don’t see here what you are looking for, please contact us to discuss your requirements. Water cooled and squarewave 375 amp max AC/ DC Tig welder c/w foot control - known for its excellent weld quality and supreme reliance. The welder is in excellent working and physical order - 9/10. The unit can weld the lightest gauge material (inc all ferrous material , magnesium and Aluminium and its alloys) to the very heaviest gauge. Functions include - HF start or lift arc , Crater fill / slope down , AC Balance for squarewave, post gas control, pre gas control, High/low range, Arc control and start control. 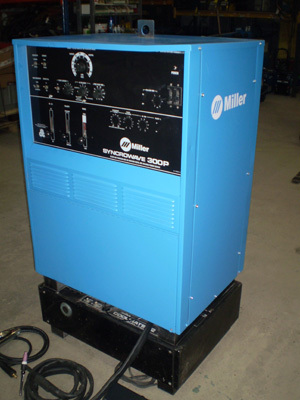 The unit has a welding range of 5 - 375 amps AC or DC and a duty cycle of 60% @ 300 amps.The package comes complete with a foot control, WP 18 a Water cooled tig torch, earth lead, gas hose, operators manual and 6 month return to base warranty. Carriage to England and Wales is £55 + VAT = £66.00 - elsewhere please contact us for a quote - stating post code, area code or Zip code. You are more than welcome to come and try the machine here in Stourport. If you have any questions please email or call us on – 01299 878965. For sale - a top of the range European built inverter - Kemppi PS5000 (500 amps) power source, Kemppi FU30 4 roll Heavy duty Wire Feed Unit and Kemppi TU50 HF and sloping Tig Unit. All the equipment is in excellent working and physical order 8.5/ 10. This is the complete welding Package, ideal for site or in-house work. 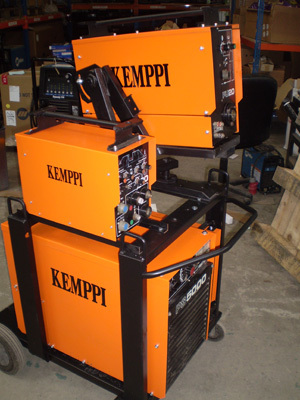 Kemppi PS5000 power source - can be used alone for MMA welding from 15 up to 500 amps DC. With the addition of the FU30 Wire Feed Unit (inc 4 Meter interconnections.) You can Mig weld from 40 up to 500 amps. The functions on the wire feed unit inc- remote power setting on panel, variable wire speed, wire inch, and gas purge. Adding the Kemppi TU 50 unit you can DC tig from 10 - 500 amps. Functions include HF Start or Lift Arc, slope up, slope down, latch or non-latch and local or remote mini log functions and many more - we can supply a foot control to suit for an additional £135.00. Included in the sale - Kemppi PS5000, Kemppi TU50 Tig unit, Kemppi FU30 4 roll wire feed unit, all inter connecting cables, New MB36 Mig Torch, New WP 26 Tig torch, earth, gas hose, Operating manuals for all units and 6 month return to base warranty. We can add a new water cooler, MB501 water cooled mig torch and WP18 water cooled tig torch for an additional £350 + VAT. Carriage is £55 + VAT to mainland UK. Elsewhere please contact us for a quote stating your postcode, area code or zip code. You are more than welcome to come and try the machine here in Stourport.